I shop online often as well as prep images for online sales, so I know how the right photo of a product can make or break a sale. If you take a little extra time and effort into editing photos, you will gain credibility, provide accurate details about your product and increase sales. Option 1 is shown laying on the floor – Is the floor dirty? Does the seller have pets? Is that really the best place they could find to take the photo? What condition will they be in if I buy them? 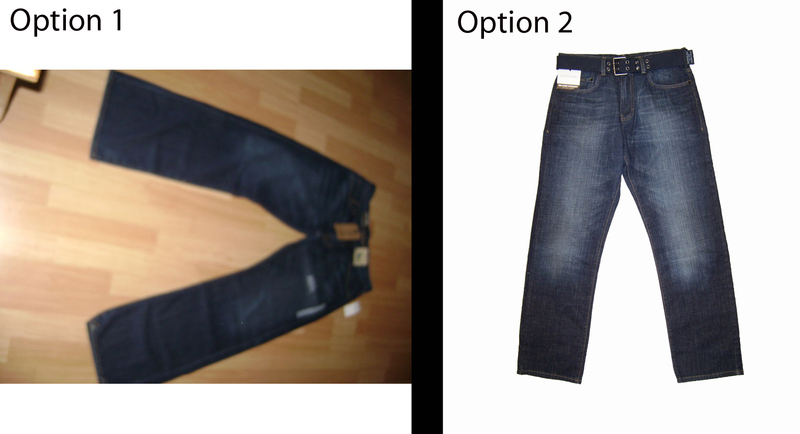 Option 1 is really blurry – How accurately does that represent the product? If they are careless enough to post a blurry photo, are they also careless in their customer service? Option 1 is sideways – Any standard imaging program that comes with a computer will allow you to rotate a photo; many cameras even offer that option right on the camera. Is it really that difficult to show the image correctly or is it easier to make your potential customers tilt their head? Option 2 is clean, accurate and easy to look at. It’s also half the price of option 1. I think I know which one I would choose based just on these photos. When working with photographing products, it is important to view the product as a consumer would. Get several angles, close-ups and a photo of what the item will look like when the customer receives it. Is it packaged? Does it come in a carrying bag? Editing is a huge factor as well. You can have a great photographer, but there’s always the possibility of strange shadows, discoloration or even requirements from the online vendor. For example, amazon.com requires vendor photos to have a white background to fit in with the general look of the site. Editing doesn’t have to be difficult. And with programs such as Adobe Photoshop, there’s no reason to not make your photos look as great as possible. Start by taking a large photo. Photos between 2,000 and 3,000 pixels allow you to zoom in while editing to work in higher detail than photos under 1,000 pixels. Many sites prefer images over 1,000 pixels to allow zoom features to work properly. Avoid the Magic Eraser. I’m sure it is useful for something, but in most cases, you won’t end up with a clean, final looking product photo using it. Try the Quick Selection Tool and masks for larger items, especially those with neutral backgrounds. Add to the selection with the plus brush, subtract with the minus. Add a mask & refine with the mask edge setting. For high accuracy, use the Pen Tool to pinpoint specific points around an object. This is exceptionally great for small objects like jewelry or intricate items requiring close, detailed work. Correct the color. Don’t rely on the auto-color feature because Photoshop doesn’t know what your photo is supposed to look like. Give it a try if you want, but instead, adjust using the levels then curves if levels don’t get you the result you want. Sometimes the smallest adjustments make a huge difference. Below is a before and after image I did. My photography booth wasn’t set up at the time, so I took the photo in the sun room for natural lighting, but it added a bunch of shadows. I corrected the color using levels, then removed the background using the pen tool. While the before photo isn’t awful, it is very distracting. The after photo forces the viewer to look at only one object—the object for sale.